At Palmer Masonry Restoration, Safety is our #1 Priority. Ensuring all of our jobsites are up to date with the latest construction safety standards and practices is our top concern. We are committed to providing all of our employees the tools and training necessary to provide a safe working environment for everyone on and around our jobsites. Palmer Masonry Restoration employs a full time safety director. It is the job of the Safety Director to ensure continual training, keep records of all certifications and complete weekly jobsite inspections to ensure a safe working environment. Each year Palmer Masonry Restoration employees obtain State, FBI and Child Verification background clearances. Our employees also receive OSHA 30 hr Training, Yearly Respirator Fit Test, Fall Protection Certification, Ariel Lift Certification, Scaffolding Hazard Awareness Training and Silica Exposure Training. Equipment Maintenance Manuals and Job Site Tool Box Talks are also key Elements of our safety program. 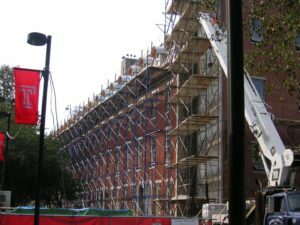 Upon Request Palmer Masonry Restoration will develop a Site Specific Safety Plan to satisfy the needs of our clients. We feel that all of these elements will contribute to a safe and successful project that we are sure will create a comfortable working experience for everyone involved.